Hello Friends, Are you looking for MPSC Recruitment 2019? If yes, there is news for you. 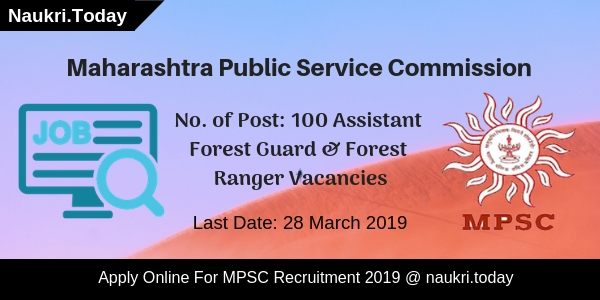 Maharashtra Public Service Commission has published notification for recruiting candidates on 100 Assistant Forest Guard & Forest Range Vacancies. The Online Registration process will be started from 08 March 2019. Interested aspirants may fill up their online form before the last date that is 28 March 2019. Agricultural Engineering Student can apply online for Maharashtra PSC Vacancy. Unreserved Category candidates have to pay Rs. 375/- as an application fee. Reserved category aspirants will submit Rs. 275/- for registration charges. How To Know The Confirmation Of Successful Registration For MPSC Recruitment 2019? What Is The Payment Method Of Application Fee For Maharashtra PSC Jobs 2019? How To Fill Online Application Form For MPSC Civil Judge Vacancy 2019? For Assistant Forest Guard Posts: Graduation in Following subjects from a recognized university. Subjects are: Chemistry/ Zoology/Botany/Geography/ Math/Physic, etc. Candidates who have a Bachelor’s Degree in Agricultural and Engineering are also eligible for MPSC Vacancy 2019. For Forest Range Posts: Graduation in Relevant subject from any recognized university. For Assistant Forest Guard Posts: ₹9300- 34,800 and Grade Pay ₹5000 + other allowances. For Forest Range Posts: ₹9300- 34,800 and Grade Pay ₹4400 + other allowances. What Is The Physical Standard For Forest Range Posts? Candidates who are going to apply for MPSC Recruitment 2019 must check here physical standard required for forest Range Posts. Here we provided to a table which consists of Height and Chest measurements. What Is The Payment Mode of Application Fee For MPSC Assistant Forest Guard Vacancy 2019? Participants can pay their application fee through online mode as well as via offline mode. Applicants can pay their application fee through Debit Card, Credit Card and internet banking. So candidates who are interested in online payment must pay their application fee before 28 March 2019. Applicants who are going to submit their application fee through offline mode before 29 March 2019. Conclusion: Maharashtra Public Service Commission has released notification for 100 Assistant Forest Guard & Forest Range Vacancies. Candidates may fill up their application form for MPSC Recruitment 2019 before the last date. Hello Friends, are you looking for jobs in Maharashtra State? If yes, then Maharashtra Public Service Commission has made an announcement for 190 Civil Judge Post. Candidates apply online for MPSC Recruitment 2019. Online registration for MPSC Civil Judge Jobs has taken place from 01.02.2019. Participants can fill the online application form till 22.02.2019. Applicants who have Degree in Law can apply for Maharashtra PSC Vacancy 2019. For more details, aspirants must read the given article carefully. When candidate will submit the MPSC Application form, they will receive message of registration no. & password from the department. This is a proof of successful registration of MPSC Civil Judge Jobs 2019. Payment of application fee can be done through Debit Card, Credit card or Net Banking. Candidate can also make payment of examination fee of MPSC Vacancy 2019 by SBI Challan. Firstly, candidate should log on to the official website i.e. mpsc.gov.in. Then search for MPSC Jobs Notification 2019. Click on the advertisement & read it carefully. After that, eligible & interested participants can click on “Apply Online” link. Then fill all the personal details in MPSC Civil Judge Jobs Application Form. Upload your recent passport size photo & signature in online form. Recheck all details in MPSC Recruitment form. Participants can also take print out of MPSC Application Form. Aspirants must note down registration no. & password. Conclusion: Maharashtra Public Service Commission has issued notification for 190 Civil Judge Post. Interested candidates can apply online for MPSC Recruitment 2019. Participants must submit their online forms before or on 22.02.2019. Hello Friends, are you waiting for MPSC Recruitment 2019? If yes then here is a great opportunity for you. Maharashtra Public Service Commission has issued notification for 555 posts of Police Sub Inspector & Other posts. Participants who are interested can fill application forms through online mode. Online registrations for MPSC Sub Inspector Jobs 2019 have started from 09.01.2019. Closing date to apply online for Maharashtra PSC Vacancy is 29.01.2019. For more details candidate must read below article very carefully. Participants who wish to apply for MPSC Recruitment 2019 must fulfill some eligibility criteria. Here some eligibility parameters are set by the department. Candidate must check eligibility parameters required for MPSC Sub Inspector Vacancy 2019 as follows. Candidate who is filling online application form can check required qualification here. Applicants must have Degree of Statutory University & Participants who are appearing for degree examination will also temporarily eligible for MPSC Jobs 2019. Additionally, Aspirant should also have required experience for the post they are applying. Candidate should also have knowledge of Marathi Language. For more details candidate must refer to MPSC Notification 2019. Applicants must have minimum age as 18 years for MPSC Recruitment 2019. For Police Sub Inspector posts candidate should have 19 years as the minimum age. Maximum age for Assistant Tax Inspector & State Tax Inspector post must be 38 years. For Police Sub Inspector Post age should not have more than 31 years. Here upper age relaxation scheme is also applicable for MPSC Sub Inspector Vacancy 2019. For more details of age criteria candidate may refer to official notification of Maharashtra PSC Recruitment 2019. Department will organize written examination for the candidates who have applied for MPSC Recruitment 2019. Applicants who qualify in written exam will get called for physical test. Selection of the participants for MPSC Sub Inspector Jobs 2019 is totally on the basis of marks obtained in written exam & qualification in physical test. MPSC Exam 2019 will be going to be held on 28.07.2019. Here some physical standards are set by the department. Candidates who fulfill these physical standards will get eligible for the Maharashtra PSC Jobs 2019. For rest of information for Maharashtra PSC Recruitment 2019, aspirant may refer to official notification. Applicants can also download MPSC Notification either from here or from the official website. Applicants who are going to fill MPSC Application form have to pay registration fee. Candidates belonging to Unreserved Category need to pay Rs. 374/- as application fee. Participants who belong to Reserved Category have to pay Rs. 274/- as examination fee. The application fee must be paid through online mode. For more details relevant to Sub Inspector Jobs, candidate may go through MPSC Recruitment Notification from the link given below. Candidate will get paid nice salary by the department. Applicants will get salary for MPSC Sub Inspector Recruitment in between Rs. 9300/- to 34800/-. Additionally, participants will get grade pay of Rs. 4300/- for Maharashtra PSC Vacancy 2019. For more details, applicants can download MPSC Vacancy 2019 notification from the link given at the end of the article. Participants who are going to apply for MPSC Sub Inspector Recruitment 2019 must fill online application form before the last date. Candidate must fill registration form without any mistake. If any mistake found than their MPSC Application Form may get rejected by the department. Here we provide you with some instruction to fill application form for MPSC Jobs 2019. Then go to the homepage & search for MPSC Notification 2019. Click on notification link & Read it very carefully. Fill all the details required in MPSC Application form. Then Upload your recent passport size photo & signature in online form. Recheck all information given by you in MPSC Recruitment form. Afterward, applicants should make payment of application fee. Participants can also take print out of examination form. 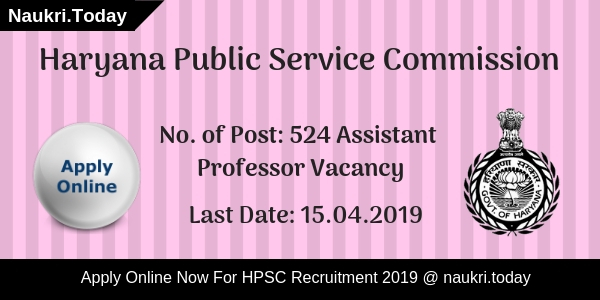 Conclusion: Maharashtra Public Service Commission is inviting application for MPSC Recruitment 2019. Maharashtra PSC Jobs 2019 have 555 vacancies for Police Sub Inspector & Other posts. Applicants can fill online application forms before or on 29.01.2019. Are you waiting for MPSC State Service Exam 2019 Notification? If yes, then here is latest information for you. Maharashtra Public Service Commission has recently released an advertisement for filling up 342 Naib Tehsildar, Tehsildar & other posts. Candidates those are interested for MPSC Recruitment 2018-19 may apply through online mode. The starting date of submission online form is 10th December 2018. Eligible candidates can submit their MPSC Vacancy 2018-19 online form till the last date 31st December 2018. The department will conduct MPSC State Service Exam 2019 on 17th February 2019. Rest information candidates you can collect from below paragraphs. Maharashtra PSC is inviting online application form for 342 various vacancies of Naib Tehsildar, Tehsildar & other vacancies. This is a great opportunity for candidates those are searching MPSC State Service Exam Notification 2019. The online application form is already available on the official site as well as here also. However, candidates can fill MPSC Naib Tehsildar Job Online Form from 10.12.2018 to 31.12.2018. Furthermore, information such as how to apply for MPSC Vacancy 2018-19? & others you can collect from below segment. Applicants those are interested for MPSC State Services Exam 2019 must fulfill the eligibility conditions. Participants who are fulfilling the eligibility criteria are eligible to fill the application form. It includes details of education qualification, age limit and other parameters. 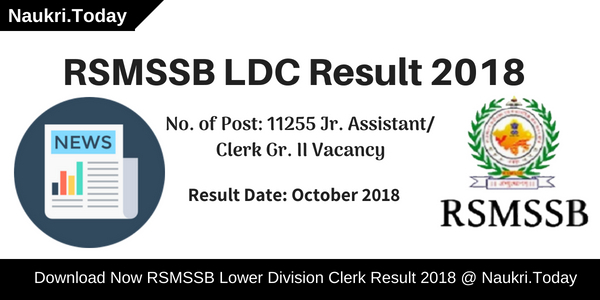 Applicants must read given below information to check MPSC Recruitment 2018-19. As on 01st April 2018, candidates must complete 19 years for MPSC Jobs 2018-19. The maximum age requires 38 years for State Service Exam 2019. Upper age relaxation is available as per Govt. norms. Candidates those want to fill up their application form successfully need to require to pay application fees also. Correspondingly, Participants, those are belonging to General or Unreserved category have to pay Rs. 524/- towards application fees. However, those belong to reserved category need to pay Rs. 324/- towards MPSC Vacancy 2018-19 fees. Fees will be pay through Debit Card, Credit Card, Net Banking or offline challan form. Candidates selection for Maharashtra PSC Recruitment will be made on the basis of their performance in written examination and interview. The department first conducts a preliminary exam then after, the main examination. Final selection of applicants for MPSC Recruitment 2018-19 will be done on the basis of marks obtained in Main Examination and Interview. Candidates those are interested and eligible also for Maharashtra PSC Vacancy 2018-19 may apply through online mode. The last date of online registration is 31st December 2018. Candidates must have valid email id, mobile no. and scan copy of photograph and signature for MPSC Jobs 2018-19. Now follow some instructions of apply online. First of all, candidates go to the official site mpsc.gov.in. Download MPSC Notification for State Service Exam 2019. Read full advertisement properly to check their eligibility. Now click on the link apply online for MPSC Recruitment 2018-19. Fill up all required information like personal & educational. Upload signature & photograph on MPSC Vacancy Online Form. Make payment of application fees through online or offline mode. Now recheck full Maharashtra PSC Recruitment Application Form. You can directly apply online for MPSC State Service Prelims Exam 2019 to click on below link. Conclusion: Maharashtra Public Service Commission has published an advertisement for recruitment of 342 Naib Tehsildar, Tehsildar & other vacancies. Interested and eligible candidates may apply online for MPSC Recruitment 2018. Applicants can fill up their application form from 10.12.2018 to 31.12.2018. The Maharashtra PSC State Service Prelims Exam 2019 will be held on 17th February 2019. I am graduated by open university so can I applied form are not? What is the MPSC STI Main Exam Date ?